The Star Ferry's Harbour Tour runs a circular route of an hour around Victoria Harbour covering calling points at Tsim Sha Tsui, Central and Wan Chai. 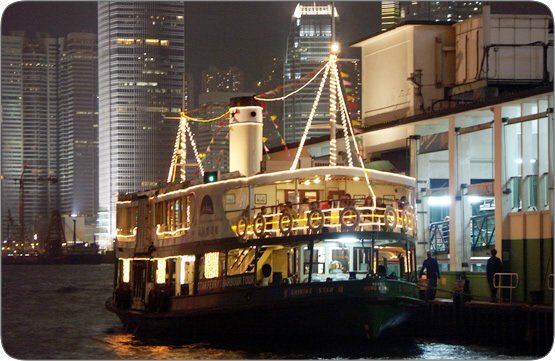 Joining this tour, you can see all Hong Kong's famous harbour side attractions. Kowloon Point Pier, Tsim Sha Tsui: 10:20 a.m. - 8:45 p.m.
Central Pier (Star Ferry): 11:45 a.m. - 8:05 p.m.
Wan Chai Pier: 12:00 p.m. - 3:20 p.m. The Star Ferry's Harbour Tour tickets are sold over the Harbour Tour ticket counter at the Tsim Sha Tsui Star Ferry Pier and the Central Pier 7 on the date of departure on a first-come-first-served basis. No online booking and reservation is currently offered. Please purchase in cash of Hong Kong dollars.